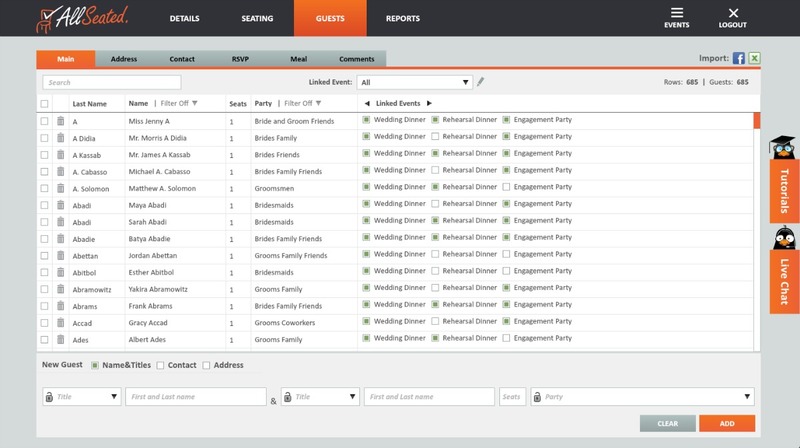 AllSeated provides an event organizer the collaborative tools necessary for planning all types of events. 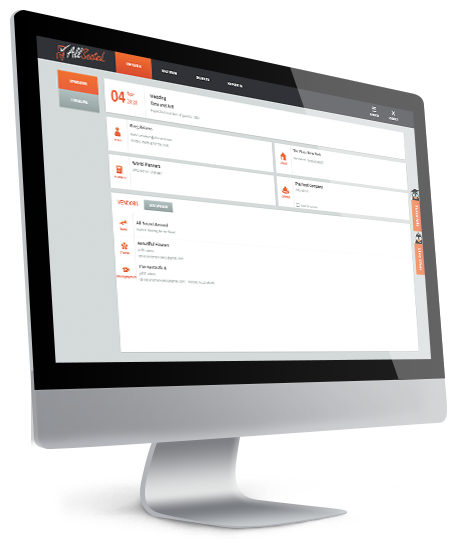 AllSeated gives an event organizer the ability to manage guest lists, floorplans and seating arrangements all in one place while saving hours of time in the process. Why should an event organizer use AllSeated for events? Build and manage an event guest list within AllSeated. Easily enter guest names and mailing addresses which can be stored alphabetically or filtered into categories for even easier organization. Your guest list links directly to your seating and has spaces for you to keep notes, enter meal type information and track RSVP’s too! An event organizer can easily design floorplan layouts using a few of AllSeated’s simple tools. Select your desired tables and furniture pieces from the vast furniture libraries within AllSeated to efficiently arrange the floorplan for your event. All updates to your floorplan are made in real time and the collaborative aspect of AllSeated allows you to share and discuss the details of your floorplan. At any time during your event planning process, view the floorplan in 3D to create a virtual walk through of the event! Once your RSVP’s have been received, begin to arrange the seating chart. The guest list links directly to your seating making it really simply to tackle your seating arrangements. There are many options available to you as you create your seating chart. Guests can be seated at tables or assigned to specific seats at each table, depending upon how you wish to structure the event. You can also add or subtract the number of chairs at each table to meet your event’s specific needs. View every detail of your digital seating chart and floorplan including table placements, dance floor location, lounge area, and DJ booth in 3D to effectively see what your event will look like in advance of the big day. AllSeated provides an event organizer the easiest and most effective way to collaborate with vendors and entourage regarding the details of an event. Invite close friends and/or family members into the account for help with things like entering guest information, opinions on your floorplan and assistance in arranging your seating chart. An event organizer can also invite vendors into an account in order to collaborate in real-time regarding floorplan layout and event timeline. 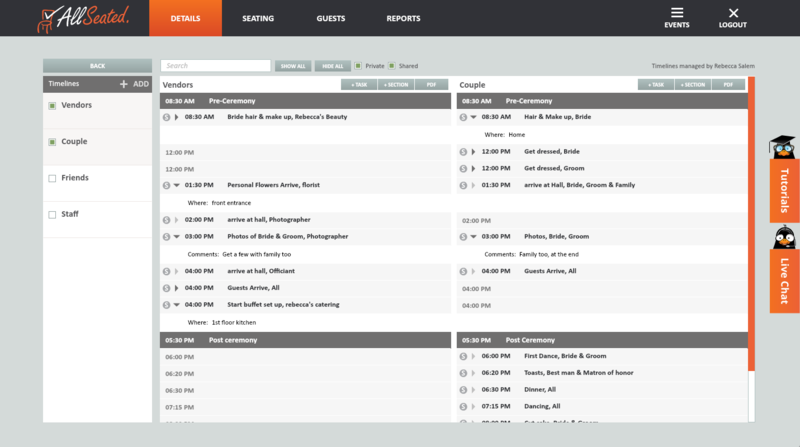 Create multiple timelines for your event. Consider a day-of timeline for beauty appointments and photography times while also building a timeline for vendors. Collaborating with your vendors within a vendor timeline will keep everyone working from the same page regarding the event. The vendor timeline will allow for vendors to understand the flow of set up, event details and the timing of break down at the end of the night. Generate useful reports which can be filtered to meet your needs. Creating reports from both your guest list and floorplan for vendors serves many purposes. Your floorplan report will dictate your desired layout along with your seating so that the room is set up the way you desire. Your guest list report can be given to the calligrapher for invitations, place cards and even for personalized favors. Available through download in the App Store, AllSeated’s Day-Of App for tablets is built specifically to use the day of your event. AllSeated’s Day-Of Mobile App for tablets allows you access to your event on the go with features such as full check-in system, real time collaboration, live check-in updates, overview of check-in status, and ability to view floorplan in both 2D and 3D.